Hibs boss Neil Lennon has revealed he’d been tracking Lithuanian striker Deivydas Matulevicius for a year before snapping him up as his sixth signing of the summer. With all eyes on the ongoing saga over Anthony Stokes, Lennon pulled off a surprise by bringing in Matulevicius on a two-year contract to add to the earlier arrivals of Danny Swanson, Simon Murray, Efe Ambrose, Ofir Marciano and Steven Whittaker. While admitting the 28-year-old isn’t prolific in terms of goals scored in a career which has taken him to Poland, Romania and Belgium, Lennon firmly believes 6ft 3in Matulevicius can make a difference at the top end of the pitch. He said: “He’s a target man and he’s mobile. I wouldn’t say he’s prolific but, if he was, then he certainly wouldn’t be coming to play in Scotland with the attributes he has. There’s room for improvement with him and he knows that. I think he will add a very good dimension to our attacking play. “We’ve basically been looking at him since we came in. When we knew he was going to become available then we pushed the button. We live in a bubble. There are a lot of good teams in eastern Europe and a lot of good individual players. And, having played with the likes of Emile Heskey, Chris Sutton and John Hartson, Lennon was adamant big strikers such as them can make a big difference to a team. He said: “I think it’s important in certain games to have a physical presence. Grant Holt did a great job for me last year with his experience, know-how and physicality. Matulevicius isn’t likely to feature in tonight’s Betfred Cup clash with Ross County in Dingwall having only arrived in Edinburgh on Thursday afternoon, but Lennon reckons it won’t be long before he is ready for action. “I like what I see with him,” said the Hibs head coach. “He’s come in great condition. He has done some physical work that he sailed through. He has trained with the players and he is hungry. “Sometimes you find these players who don’t come for the money, they come for ambition and to improve their careers. He has played in Romania and in Belgium at quite a high standard. Sometimes we dismiss these leagues because we are in a bubble here in Britain. There are actually good-quality players out there. 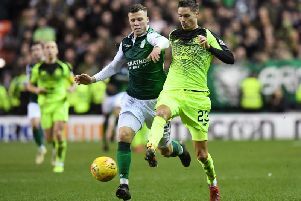 Lennon admitted he was delighted to have brought Matulevicius in under the radar, revealing that leaks from within Easter Road were hindering his summer recruitment although he made it clear he wasn’t blaming the press for “doing their job”.